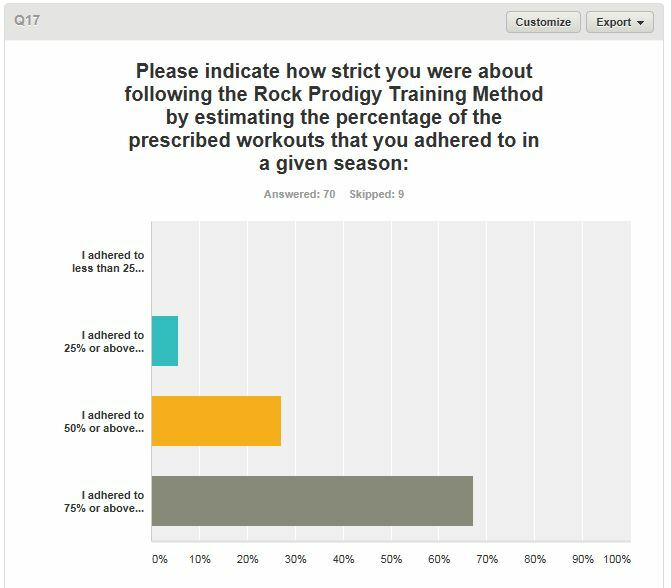 In February we launched the first-of-its-kind survey to collect data on the effectiveness of the Rock Prodigy Training Method and the Rock Prodigy Training Center. So far, 118 folks have responded to the survey (from 13 countries), which is well above what I expected…THANK YOU! I’m furiously writing my research paper for the 7th Asia-Pacific Congress on Sports Technology which will be held in September. The draft is due on Friday, the 17th, so if you would like your results included, you’ll need to complete the survey by tomorrow! We’ll be closing down the survey after that (but expect more in the future). See this post for some more instructions on how to take the survey. Preliminary Results of Question 17. Question 17 asked how well we are adhering to the program, which I found very interesting. I was surprised and pleased to see that most of you are following it pretty strictly. When we wrote the book, we feared that most folks would “cherry pick” exercises out of the book rather than executing the program as a whole. We were worried that such an approach would not be very effective, and these climbers would draw the wrong conclusions about the effectiveness of the program. We’re glad to see that people are giving the program a fair shot by taking a “whole-system” approach. Survey respondents’ impressions of the effectiveness of the RPTM. Psyched! 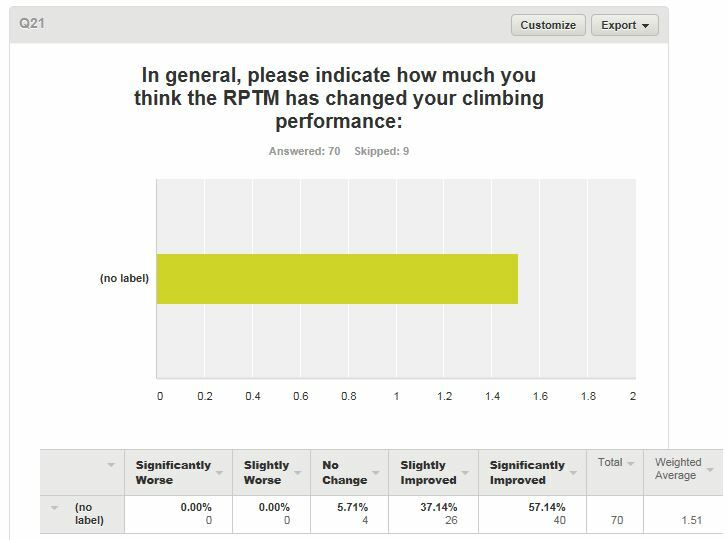 Question 21 asked how you think the RPTM has changed your climbing, and over 94% of respondents believe they have improved, with over half improving “significantly”. This is tremendous! It is something we as a training community should be very proud of because this program is an ongoing collaboration, and we developed it with lots of input and feedback from the community. As we go about our training, it is extremely motivating to know that what we are doing is effective, and it will bring us results in the long run! The hangboard grip data is pretty impressive too, with folks averaging about a 30 lbs increase in grip strength per grip after their first season, and people pushing into 50+ lbs improvements over the 18 months since the RPTC was introduced! If you haven’t already, please contribute to the science, let your data be heard, take the survey. It would be really cool if you post the paper when it is finished. I don’t know if that is something you plan to do, but I would be excited to see it.